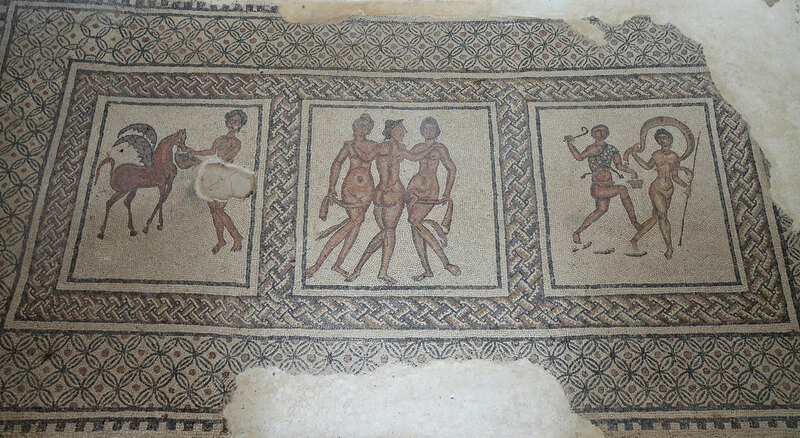 This Friday, Rubèn Montoya (Leicester) Lucy Elkerton (Bristol) present a panel on: "On displaying interior décor and identity(ies): a contextual approach to Hispano-Roman mosaics". The PGWiP seminars are held on Friday afternoon at 4:30 pm, at the Senate House, London, second floor, room 246. Everyone is more than welcome to attend the seminars and no registration is required, but MA and PhD students are especially encouraged to take part in them. This Friday, Rubèn Montoya (Leicester) Lucy Elkerton (Bristol) present a panel on: “On displaying interior décor and identity(ies): a contextual approach to Hispano-Roman mosaics”. In the last two decades, approaches to Roman art have changed from a primarily descriptive and static discourse influenced by Pompeian examples, to a more theoretical debate concerning the nature and diversity of provincial evidence. This panel will contribute to the latter vibrant discourse focusing on a contextual approach to the display of Hispano-Roman mosaics. While previous approaches have been largely limited to the social meaning of their iconographies, both papers will show the need to re-evaluate Hispano-Roman evidence to further investigate aspects such as patronage, personal-choices and self-representation in the display of mosaics in the private sphere, at both local and regional levels. This paper will present a contextual approach to Hispano-Roman villa mosaics to probe questions regarding patronage, identity(ies) and self-representation. Previous focuses have generally resulted in the identification of examples in which signs of individualism (e.g. inscriptions or portraits) are detectable within the display of specific iconographies. Additionally, traditional approaches have generally presented an economic, capable, unified Hispano-Roman elite making use of a globalized visual culture. As suggested by the archaeological evidence, the phenomenon of individual self-representation appears to be more common in the provinces at the edge of the Empire, a fact interpreted by some authors as the result of a complex process of cultural contacts. Because of that, my research focuses on associated architectural contexts to further investigate the diversity of such socio-cultural elite displaying mosaics at both local and regional levels. As an example, I will draw upon some partial/fully excavated villas from the Guadalquivir Valley (Hispania Ulterior Baetica) and the Ebro Vally (Hispania Citerior); aspects regarding the regional diversity in the display of interior décor and the projection of identities will be outlined. This paper will finally posit a more dynamic and diverse Hispano-Roman socio-cultural elite involved in the display of villa mosaics, a process in which individual choices depend upon a complex network of external factors. This paper will tackle an equally important, interlocking facet of self-presentation: gender. Our conception of Roman society is that it was highly patriarchal. My research uses the mosaics of Hispania to explore and test some of these ideas. It asks whether we can use the images of gods and heroes, monsters and men that adorn these floors, to explore how the contemporary viewers constructed and understood their gender identity. How did they conceive of the concept of masculinity, and its expression as gendered identity, through these fantastical images? An interesting intersection is that the Romans frequently conceived of the provinces as gendered as feminine, and weak, taken by the masculine Roman state. How do the men of the provinces, in this case the Hispanias, reconcile this view with their own conception of masculinity? As an example, I will draw upon a series of hunting mosaics from these provinces. Hunting is specifically an elite, active pastime and suitable therefore for showing off masculine prowess. However, the iconography used in the Hispano-Roman hunting mosaics seems to represent a specific conception of Roman and Iberian masculinity. This paper will posit an interpretation where these mosaics are the product of a particular imaginative culture, and communicated as such to those viewers who inhabited the Roman Iberian world.